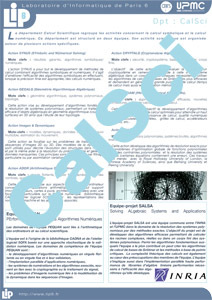 The Scientific Computing department involves activities dealing with the symbolic computing (SPIRAL team : Systemes Polynomiaux, Implantation, Résolution ALgébrique) and the numerical computing (PEQUAN team : PErformance et QUalité de Algorithmes Numériques). A first project is dedicated to designing and implementing certified algorithms for solving polynomial systems. Among the fields of applications, we can point out simulation, control and diagnostic of parallel manipulators, celestial mechanics, cryptography (in the case of finite fields), image compression and biophysics. An other project is the development of the CADNA library and the SOFA toolbox to estimate and study the accuracy of numerical results obtained with a finite precision floating point or fixed point arithmetic. This project includes the study of the numerical quality of scientific codes like those of the CPC program library or from chaotic systems. Other actions are performed. The first one combines numerical and symbolic algorithms to get guaranteed results with more efficiency. The second one is dedicated to the development of efficient and reliable numerical algorithms for grid computing. An other action aims to extract from sequences as much information as we can to incorporate them into physical models. Giving heterogeneous and multimodal data, not available (or missing) at the same time, we want to reconstruct the whole 3D sequence, where all modalities and data appear simultaneous. The last one wants to develop Boltzmann methods for the automatic generation of tests for intensive and large scale applications, particularly in tne context of testing and checking software. Symbolic computing, albebraic systems, round-off errors, numerical validation, grid computing, parallelism, data reconstruction, 3D sequences, modelization, random generation.